Kotilingeshwara Swamy Temple in Telangana Our country is a sacred and spiritual land. The holy soil has given birth to many Munis, Rishis, Vedantha Scholars and sincere devotees. Adding to its glory, the country houses several temples that were constructed by its rulers, saints and devotees and many more are being constructed for embracing humanity. 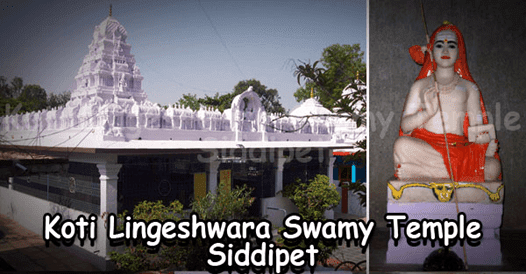 Sri Umaparthiva Kotilingeshwara Swamy Kshethram is one such establishment in Siddipet Town, Medak District Telangana. This holy shrine is located in Siddipet at a distance of 45 kms from Medak. Near the temple is a small check-dam, which serves as a very beautiful picnic spot for the people and pilgrims visiting this temple. The dam authorities offer boating facilities. This temple was built in late 1970s and there is an independent Vedic school running in the premises. The temple got its name Koti Lingeswara due to the presence of 10 million Shiva Lingas in the temple. The holy shrine is located in Siddipet at a distance of 45 kms from Medak and is well accessible by road. There are facilities available for food at Siddipet town, located 2 km away. There are facilities available for accommodation at Siddipet and Medak towns.